Based in Houston, Texas, GEV is a blog by The GreenEyed Venuist. Her posts explore travel and photography through her green eyes. The Green-Eyed Venuist There's no where to go but everywhere....so get going! I glance at my phone, it’s 4:30am….there’s only time to shower and change before we head out for another adventure. 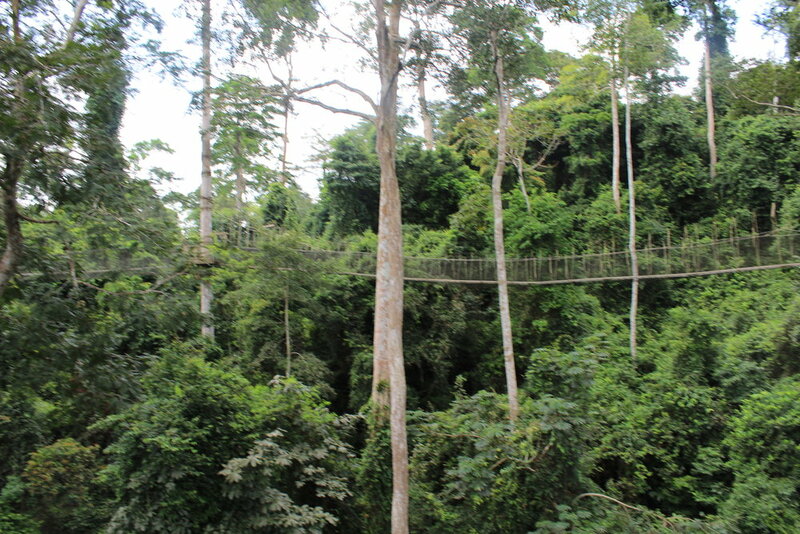 By the time we get there, Kakum will have just opened; there will be enough time to explore the park and then get back to Accra for our flight to Abidjan at 5:30pm that evening. Again, everyone was down with this itinerary except for, by the time the hour was upon us, our party of 4 was reduced to 3. Old age caught up with one of us and she stayed behind to sleep. She was obviously smarter than all of us. Our driver, Fofo, arrived right on schedule and we piled into his plush, air conditioned Camry and got on the road. This car was a huge upgrade from the other pint-sized taxis we’d been squeezing into all weekend, hips and all. I hardly ever fall asleep in car but we were all asleep before we got out of city limits. I managed to pry my eyes open a few times to take in the scenes on the way. About 3 hours later, we arrived at the park, bought our tickets and sat down for some breakfast. Little did we know that these eggs, bacon and toast would be the only thing that sustained us on the treacherous journey ahead. After breakfast, we joined the group and started the tour. 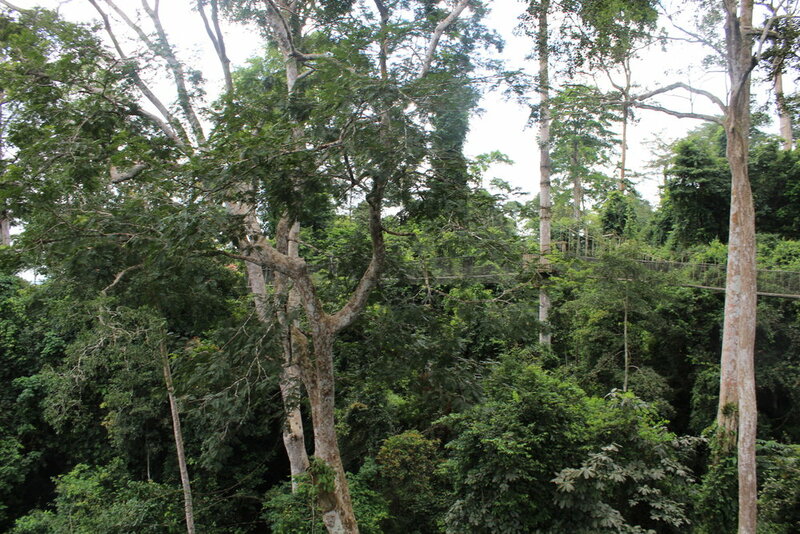 Just some insight, the area is covered with tropical forest. 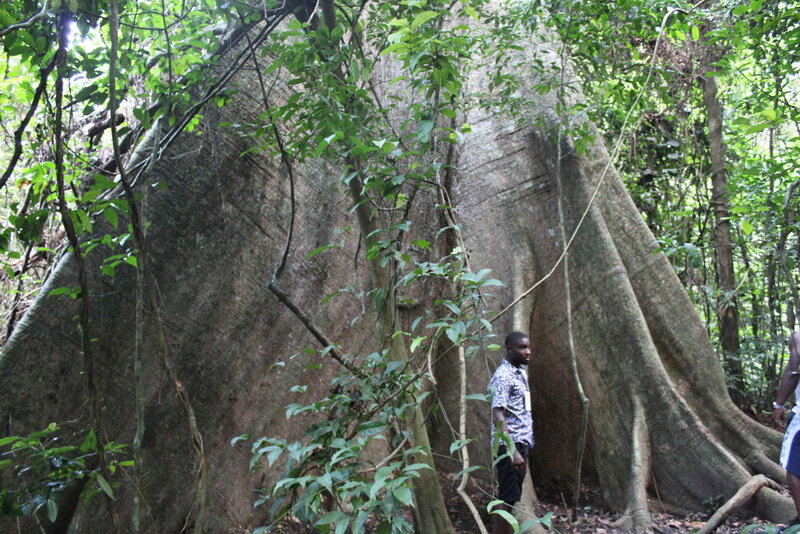 The park was established at the initiative of the local people who are responsible for wildlife preservation in Ghana. 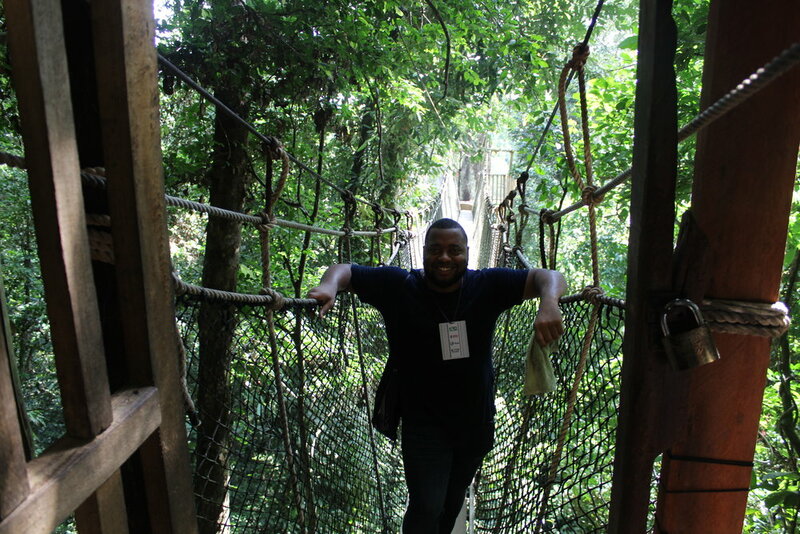 It is one of only 3 locations in Africa with a canopy walkway, which is 350 metres (1,150 ft) long and connects seven tree tops which provides access to the forest. That’s the real reason I wanted to go. We follow the tour guide about five steps, living our best lives, and then hit a set of very big steps. Like the kind where you nearly have to jump from one to the next. Like, steps made for giants only. By the time we reached the top, everyone was bent over, panting and grasping for air. Unfortunately, this was just a preview of things to come. 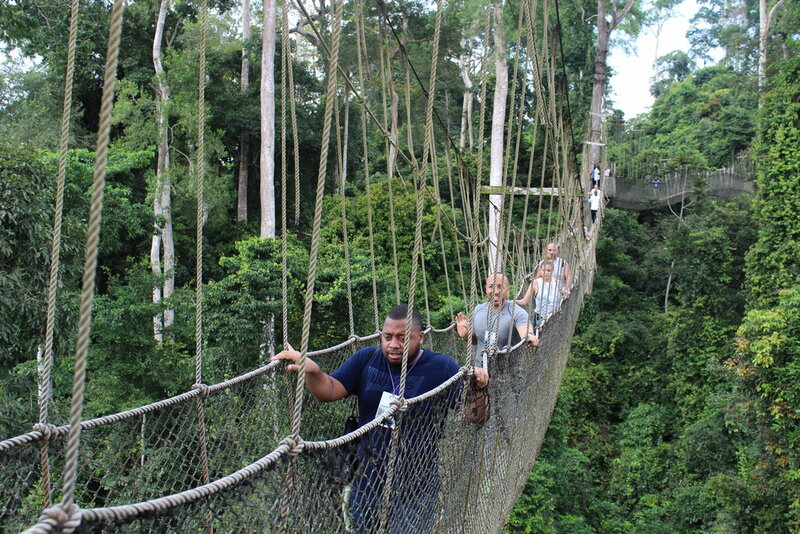 You see, the canopy walkway consists of seven separate bridges that hang from the trees over 130 feet above the ground…..you have to climb up there, right? Yeah, that wasn’t in the brochure and probably not the best idea after being out all night. Did I mention it was 85 degrees with like 100% humidity? Meanwhile, the tour guide and Fofo are literally leaping up the stairs in a single bound beside us and have not yet broken a single bead of sweat - they’re mocking the wheezing, out of shape foreigners. After more uphill climbing, my soul died a little and we finally reach the beginning of the canopies - where there are more stairs to climb (my God). I wasn’t able to get much footage of the actual hike since I was busy wiping sweat off my face and wishing I had a portable oxygen machine with me. But, here’s someone else’s video from YouTube and some pictures I managed when I finally caught my breath. We teeter across the 7 canopies. 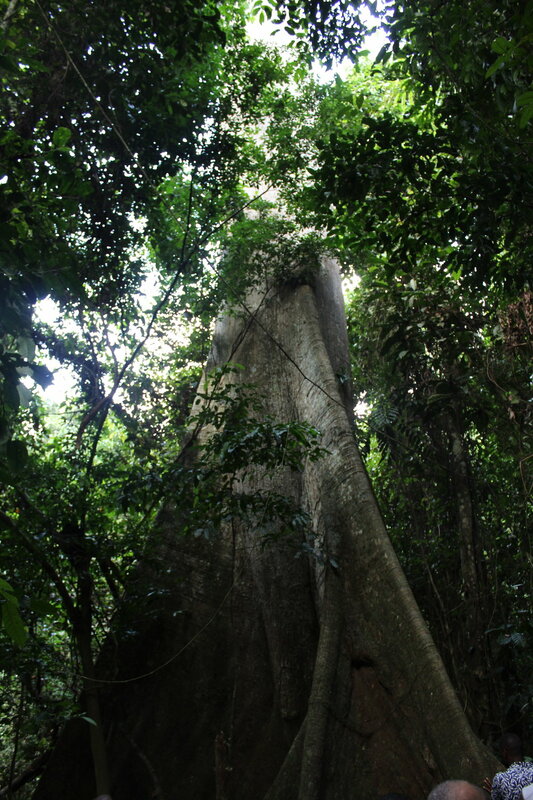 At the end, the guide tells us there’s a part 2 wherein she will tell about some of the plants/trees, the medicinal properties of each, we’ll see the largest tree in the park and the treehouse. We paid for both parts (unbeknownst to us) so we depart from the larger group down another trail in the opposite direction. Why? So we’re walking and the guide is talking; I still haven’t seen an ounce of sweat on her brow, by the way. 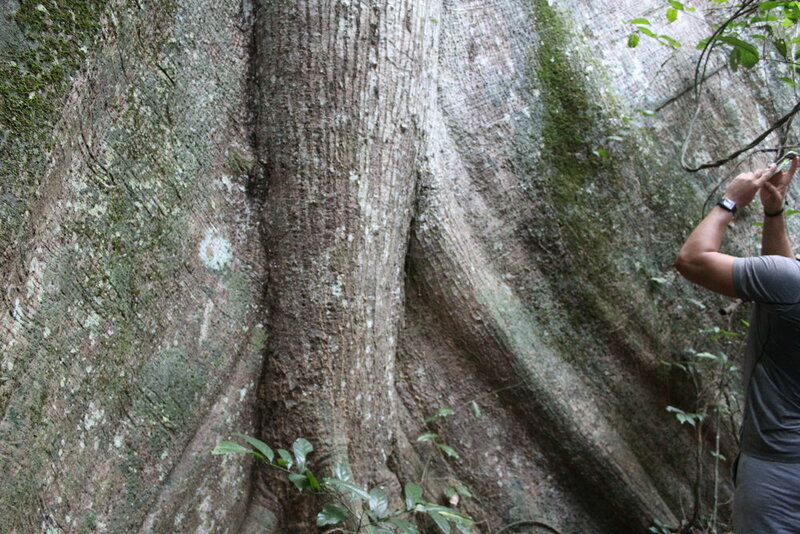 We come to the end of this narrow and burdensome trail to reveal the biggest tree in the forest. Really spectacular, see below. We back track a bit to get to the tree house and then mosey down another set of stairs, steeper this time. Honestly, I didn’t care if these stairs led me to Jesus himself, all I could think was, ‘going down these stairs means we’re going to have to come back up this same way’, and I felt my chest tighten. I did have a fleeting hope that there would be a secret, and much easier, route back to the car at the bottom of these stairs. That thought was quickly extinguished by the realization that, in the forest, nothing’s ever easy. 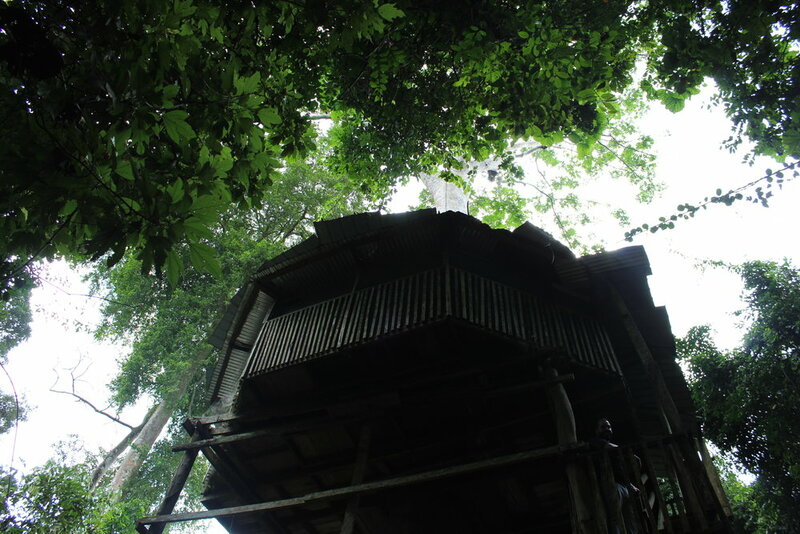 To make it worse, the tree house door was locked….so we walked down there………………..for little. Here’s the tree house (these pictures aren’t the best quality but you get the idea). Hey, remember what I said?? We went down, so we had to go back up? Remember when I said the only sleep we had was in the car on the way there? How about when I said how hot and humid it was? Can you imagine how I felt as I stood at the bottom of these stairs? If you can’t, let me tell you. It seemed to me an insurmountable task but…I’m no punk! We were in a group of people who were sweating grease and we were the only Americans. I had to get to the top, for the culture (not Americans, per se but you get my drift). So we started….and I went. It was like a real life stair master on level 10. Not gonna lie, I stopped twice to find breath. I had lost it. At the top of these devil stairs, I stopped and reevaluated my life. I thought about all the bad things I had ever done and repented because I knew that it was nothing but God that brought me through. After we picked the rest of the group off the ground, we headed back to the beginning of the trail. By this time we were literally covered in sweat and beyond traditional levels of exhaustion. We were so sweaty, our friend took his shirt off and rung what was left of his life into a puddle on the ground. He had to buy a new shirt for the ride home. As for me, instead of defiling Fofo’s car with my body’s tears, I sat on the South African Airlines blanket I swiped from our flight to Accra. We got back to the apartment hours later to find the one that stayed behind was rejuvenated and full of life…. Needless to say, taking a hike of that magnitude with little sleep, after a night of partying and no prior training was not the brightest idea. I wish I had taken more photos but I couldn’t muster the energy. However, I love having this story. Its so funny now. Beyond that, we had an amazing time in Kakum. It was incredibly beautiful and I highly recommend it with proper shoes and hydration. Cheers to starting the blog back up. I have a lot of catching up to do. I hope y’all enjoy. "VENUIST"- PRONOUNCED /'VENˌYO͞O - ƏST,IST/; NOUN - A PERSON QUALIFIED TO...... - ME, TRYING TO BE DEEP. Let's be honest......Venuist isn't a real word. As I was trying to figure out a good name for my blog, I recalled the word "venue". For those in the legal profession, venue is a place in which events giving rise to a legal action occur. We request a change of venue for a fair trial. So, I was like....that works! Change of venue....I like to change venues...but my friend already had a blog called Change of Venue....so I couldn't use that. But then when you look at the suffix -"ist" it denotes an adherent to a certain principles, a person who is concerned with or practices something specific, is an advocate for a certain system or thing or perhaps is an expert in a certain thing. So, I put the two together and created the term, "venuist" - and I like to think of it as a person who is concerned with different venues, practices in the field of travel and is proficient in that field. I am an advocate of traveling. I'm constantly seeking new places. It's an attitude or way of behaving that involves, but is not limited to, gaining an advantage by travel, any advantage, and there are many. If nothing else, it makes you a better person. Of course the process wasn't as easy as I make it seem but nothing really is and I really like the fact that it's a unique name that I came up with all on my own....and there's nothing out there like it. Believe me, I did the Google search. There you have it, I'm a venuist with insatiable wanderlust, a fire inside me that cannot be extinguished and only grows with each journey. Through this blog, I will share with you my green eyed experience...and throughout this journey, hopefully I can truly become an expert.